Lovely, Dark, and Deep is a wonderful collection of paranormal short stories exploring gay, bisexual, trans-gender and lesbian love. ** ✮.✮.✮.✮. for the collection as a whole. 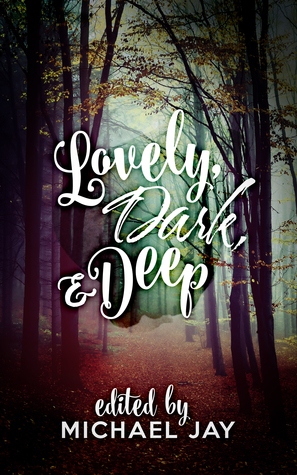 **Lovely, Dark, and Deep is a well collected and edited anthology. Some of the stories I liked better than the others, but that's the beauty of anthologies; there is always something for everyone! My favorite picks would be The Warmth of Home by Jamie Sullivan and The Forest Prince by Hope Medina.Individual Reviews to follow.----------Before the Snow Falls (the Dead Walk) by Barbara Geiger-> M/M Luke has been hired by his best friend's parents to find Kent, Jacob's little brother who went missing after joining a cult that turned out to be quite creepy and very dangerous.The In-Between by C.J. Munoz-> M/M Beneath the Hollow Hills by Althea Claire Duffy-> F/F The Forest Prince by Hope Medina-> M/MDragon's Curse by Stephanie Rabig->F/F/FJorogumo by Odile Mab->M/MWorld View by Charles Yoite->Q/TAll the Flowers of the Wood by Elizabeth Gray->F/FPrincess Lily and the Dark Wood by Alice Brix->F/FThe Tree Hugger by Lucy Kemnitzer->M/MBecoming Shadows by Khrista Coyner->M/MMacey by P. Talbot->T/BUninoch by Michael C. Schutz-Ryan->M/MThe Warmth of Home by Jamie Sullivan->M/MJosh lives a secluded life in the woods. One day he finds an injured crane in the snow. He takes the bird back home and tends to its wounds. They bond over the weekend, and for the first time Josh doesn't feel so lonely anymore. He wishes he didn't have to let it go back into the wilderness, and perhaps someone might even grant him that wish! ?Many thanks to the publisher who kindly provided a free copy for an honest and impartial review. Featured on All Our Worlds!Wilderness has always held a place in the human imagination as a place of monsters, of spirits, of hidden civilizations. These stories explore all of that with a huge helping of queer romance. The forest is forbidden, or the forest is home. The forest is full of monsters, or wonders. And when the outsiders meet the residents of these strange places, things are going to get exciting.I liked most of these stories. A few were a bit too strange for my liking, or just didn’t interest me. There’s a huge variety, so there’s going to be something for everybody.My favorites were Beneath the Hollow Hills, where a woman searching for food is captured by an elven camp who must then decide whether they can trust her, Dragon’s Curse, where an undead squire goes on a quest to help a princess and a dragon, and The Warmth of Home, where a man rescues an injured crane in the forest and gains a new friend- and then partner. I was able to read this book courtesy of NetGalley.I have to say I was pleasantly surprised by this book. It is a nice mix of new and established authors, and a nice mix of FF & MM themes. All had an ominous feeling which might make people nervous if reading in the dark. I would recommend this book to anyone who likes paranormal LBGT fantasy with a dark side to it, especially if there is an author in the book they know and like. It is a good opportunity to learn about some brand new writers and maybe some you missed.